During the first weekend of May, from the 4th through to the 6th, the inaugural international Alfa Romeo GT owners' meeting took place. The meeting was organised by the German internet forum alfa-gt.de. This is a growing internet 'community' of more than 200 fans of the new Alfa Romeo GT Coupé with members located in Europe and as far as Australia. This first international meeting took place in Oehringen, Germany at the Alfa Romeo agency Klaiber in Baden-Württemberg. The first participants joined up with the meeting during the evening hours of the 4th May in a special area prepared by the Klaiber agency. The drivers and their Alfa GTs came from Italy, Switzerland, Austria and Germany. In total 35 Alfa GTs took part as well as other Alfa Romeo models. After initial hellos from the organisers and the agency the Alfa GT cars were at the centre of discussions. Each single car was examined and there was much talk. It was also possible for the participants of the meeting to test drive other Alfa Romeo cars in the dealership. So drives were possible with an Alfa 147 GTA powered by LPG, with a power boosted turbodiesel Alfa GT JTD or also with the new differential-fitted Alfa GT JTD Q2. Another Alfa GT, fitted with Lamborghini-style upward-opening doors and a power boosted Alfa Romeo Brera 2.2 JTS were also demonstrated. Klaiber showed a great deal of enthusiasm in helping to realise this meeting. After this all the Alfa GT cars made a pleasant round trip deep into the attractive Oehringen country-side, in the Hohenloher county. 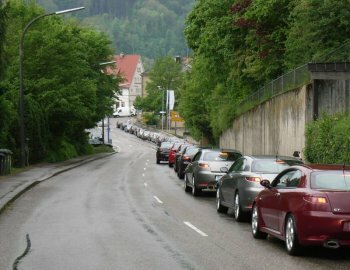 All the Alfa GT cars made a round trip into the Oehringen country-side, the Hohenloher county. During the tour it was also possible to visit the car museum in the ancient castle. 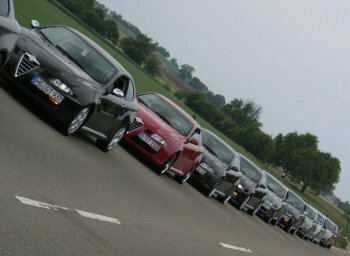 During the first weekend of May, from the 4th through to the 6th, the inaugural international Alfa Romeo GT owners' meeting took place. During the tour it was also possible to visit the car museum in the ancient castle. After this visit the cavalcade continued, finishing later on, again at the car agency. Then it was time to award prizes, a cup was given for the longest distance travelled to join the meeting, a cup for the most beautiful Alfa GT and also the so-called “Knight-Sport-Medal” for the most exact estimation of the highest fuel price. Later on all the Alfa GT drivers received a small parcel from Alfa Romeo Germany. The day finished in the homely old town of Oehringen with a communal dinner.